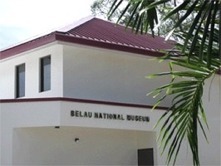 The Belau National Museum ( BNM ) is a non-profit semi-autonomous agency. 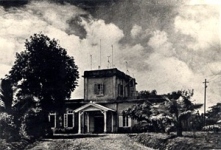 Established in 1955, it is the oldest museum in Micronesia. Originally occupying a small Japanese era building near the police station, in 1955 the museum relocated to the first floor of the former Japanese Administration Weather Bureau. Its New Permanent home was opened in 2005. The Belau National Museum (BNM) is a dynamic institution for the preservation and promotion of the national heritage, exhibition of natural, cultural, social and historical values, and the development of arts at all levels. The Belau National Museum is an institution of learning established to collect, cultural, preserve and display object of scientific, cultural, historical and aesthetic value. The Museum's purpose is to preserve and protect the nation's cultural heritage through collection, identification, documentation, preservation, interpretation and exhibition of specimens, artifacts and other Palauan cultural property. To meet its mission, it is the objective of BNM to undertake more marketing, effective research, documentation, collection and presentation of artifacts, natural history and the development of activities aimed at stimulating interests in culture and the arts. To this end, BNM envisages as its immediate objective the following areas: preservation and promotion, education, heritage management, fiscal responsibility and the culture and nature of its community. Maintain and develop facilities which protect the collections in a controlled environment, free of congestion with regulated light, temperature and humidity levels, and safe from damage of pests. Create an environment which presents the nation's history, nature and culture in an effective and inviting atmosphere. Expand community awareness of the role of BNM through education programs. Liaise with Palau's stakeholders to assist in identification, research and interpretation of tangible and intangible culture to protect, preserve, promote national heritage. To promote the mandate of the Traditional Knowledge and Expressions of Culture Act. Develop a revenue base to assure BNM ongoing financial viability through revenue-generating projects as well as grants from government, corporate sectors and overseas development agencies.